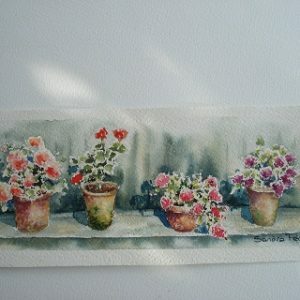 Join local artist Sandra Peck for a really enjoyable, relaxed and informative day. It doesn’t matter whether you are a beginner or have been painting for a while. You will have a chance to sit up close and watch detailed demonstration and then have a go yourself, at your own pace, with help as you need it throughout the day. There is something adorable about characterful old terracotta pots full of summer flowers. How to paint them, verdigris and all, using delicious wet-into-wet watercolour.